Location: North side of Station Road west of its junction with Works Road. The access ramp is from Works Road. 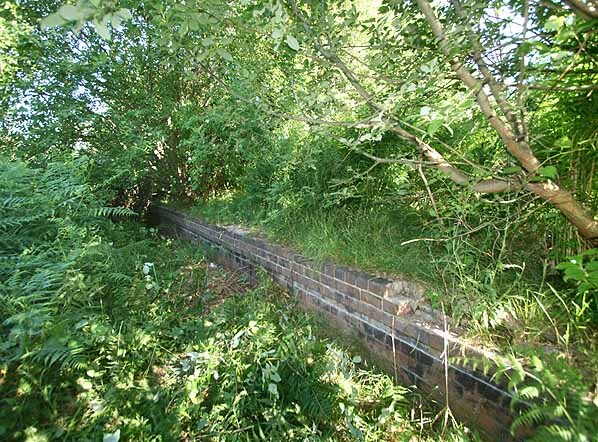 Present state: The degraded and heavily overgrown east end of both platforms survive as does the bridge over the Chesterfield Canal. Two concrete railway gate posts can still be seen at the start of the approach ramp up to the booking office. 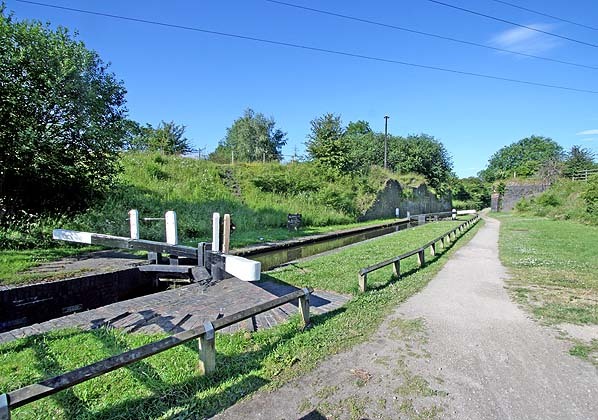 Notes: The Chesterfield Canal, which was owned by the MS & LR, was extensively diverted in this area, with a new lock created. 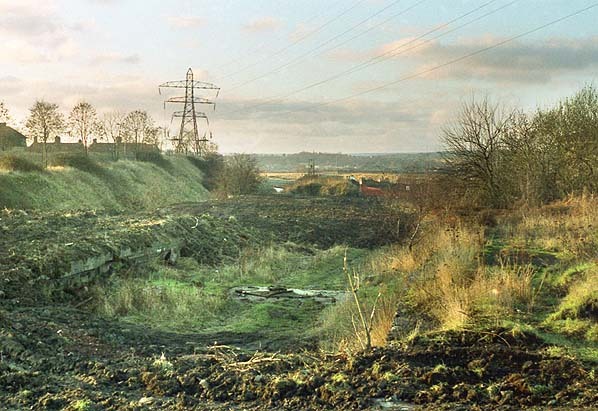 Parts of a large cinder tip, to the west of the station site, were removed to make way for the works, the material being used for embankments. Eight pairs of semi-detached ‘Railway Cottages’ were built in the area - these still survive at the north-western end of Station Road. Parts of the cinder tip (furnace slag) remained until comparatively recently at the bottom of the New Brimington area. In 1898 the tip was served by a small branch from sidings, which started immediately west of Staveley Works station. These sidings were created to tap into the business at Staveley Works. 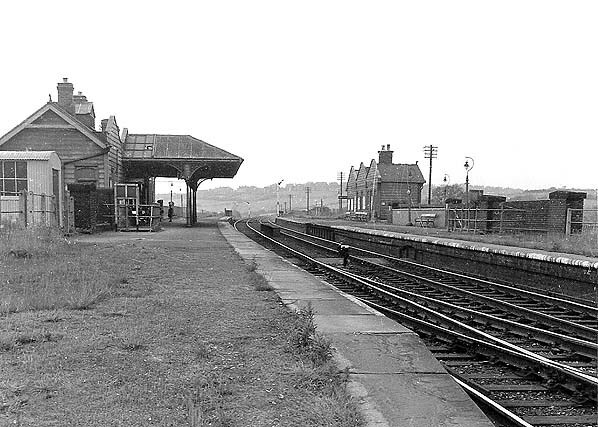 1950's while that on the down platform was built. 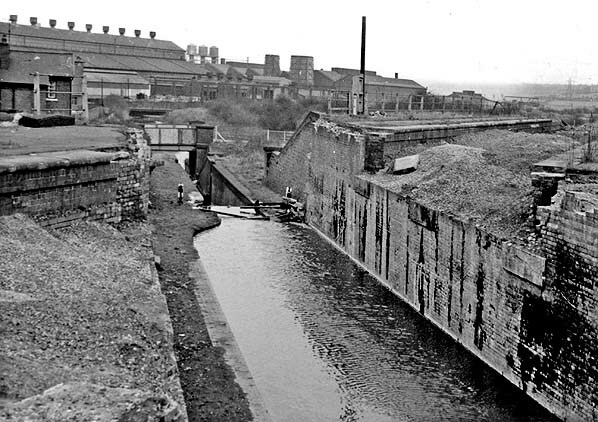 The Chesterfield Canal ran underneath the station at its east end with a lock and lockkeeper's cottage sited on the east side of the station. The station was located in an area of heavy industry, the largest employer in the area being the Staveley Works Foundry which provided much of the passenger revenue but this was not maintained after WW2. An analysis of passenger traffic carried out by BR for the week ending 19 August 1961 showed only 288 passengers using the station which closed on 4th Match 1963 when the Great Central local service was withdrawn. 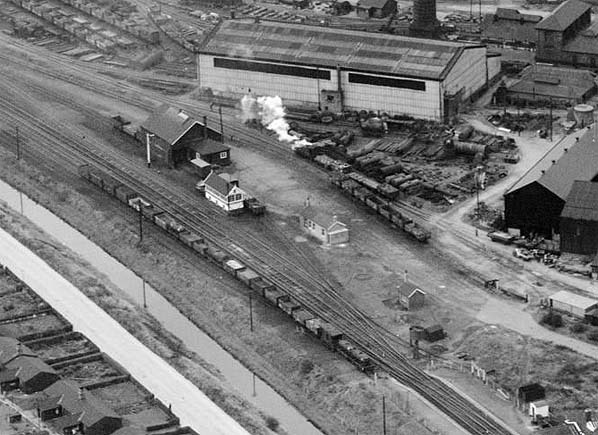 The foundry had an extensive railway connected to the Great Central and the Midland Railway a short distance to the north but Staveley Works Station never handled much goods traffic, losing its goods service on 1st December 1955 although a private siding did remain in use after that date. Selected further reading: Great Central Memories by John MC Healey published 1987 by Baton Transport ISBN 0 85936 193 4 - heavily illustrated history of the London Extension. Great Central Then and Now by Mac Hawkins - published (2nd edition) by BCA 1992 ISBN 0 7153 9326 X , station by station photographic survey of the Great Central between Sheffield and London with numerous 'then and now' photographs. See also Sheepbridge & Brimington Station and construction of the Manchester, Sheffield and Lincolnshire Railway through Brimington by Philip Cousins. Published in St. Michael & All Saints, Brimington parish magazine. (Click here for full text). Tickets from Michael Stewart except 2066 Glynn Waite. Click here to see a video of Staveley Works station and the adjacent lock on the Chesterfield canal in November 1986 (requires Adobe player or compatible). 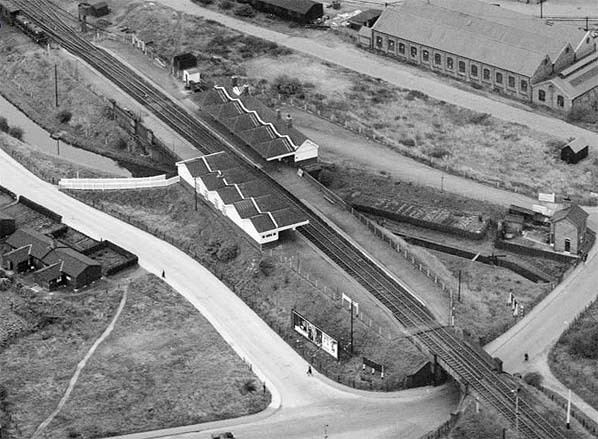 Staveley Works station in October 1946. 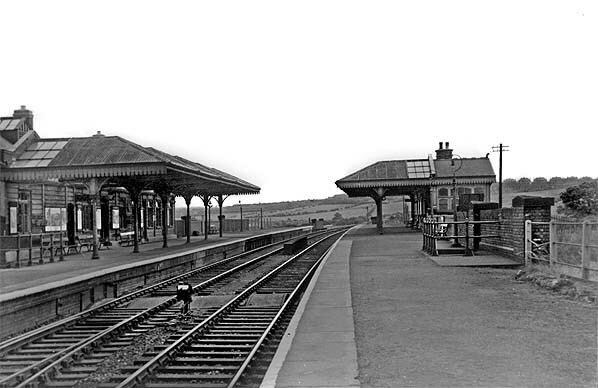 The main station building is on the down (west side); constructed of timber with a ridged roof extending over the platform as a canopy. An inclined path leads up from the road. The up side building had a pitched slate roof with a ridge canopy stretching the full width of the platform. The subway can just be made out immediately north of the up platform building. The Chesterfield Canal is seen passing diagonally under the station with a lock and lock keeper's cottage on the east side. The approach road to the goods yard runs parallel with the lock to the north. 1898 1:2,500 OS map shows the station as built 6 years earlier. The offset station buildings and canopies are shows as is the inclined access path up from the road on the down side. To the left of the station buildings the subway can just be made out as a dotted line. The goods yard is to the west of the station on the up side. It comprises two sidings, one looping thorough a small goods shed with a signal box between the sidings on the east side of the shed. A third siding curves round the north side of the goods shed. 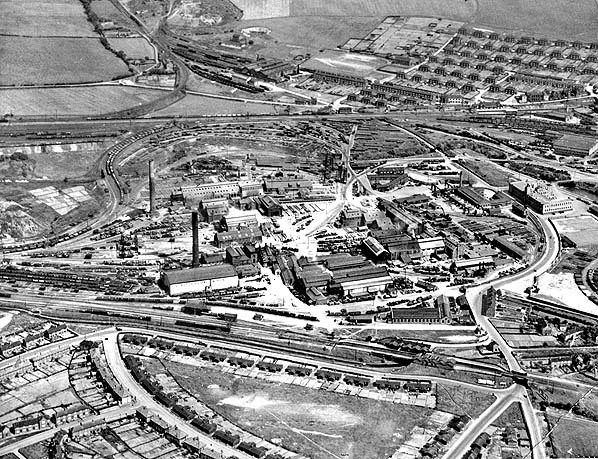 Staveley Works goods yard in October 1946. There were only basic goods facilities and the yard didn't handle livestock and was not provided with a dock. Wagons are seen in the shed siding and coal wagons are seen in the northern siding. Compare with the map above; another siding has been added parallel with the northern siding. The access road is seen on the right; the first building is probably a weigh office although no weighbridge is obvious in front of it. 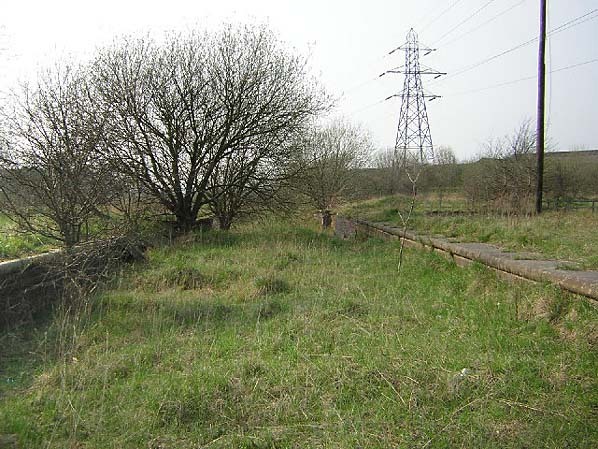 The 1904 Railway Clearing House handbook of stations lists a 1 to 10cwt yard crane although it's not visible in this picture or marked on the map above. It is probably obscured by the goods shed. 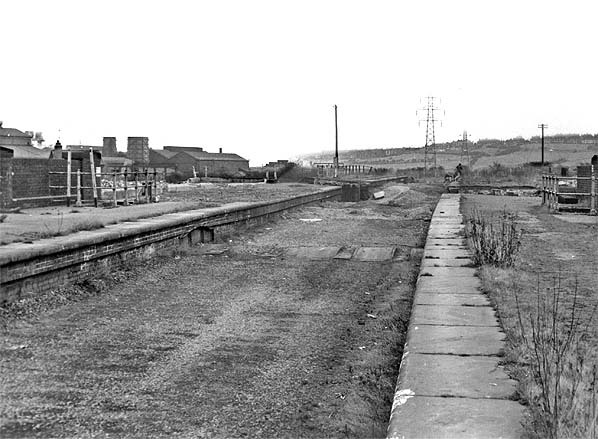 Staveley Works station looking south-east along the up platform c1950. A few years later the down side canopy would be removed. The subway is seen in the foreground. Staveley Works station looking south-east in c. 1950's. The up platform building has now lost its canopy. The subway is visible in the foreground. 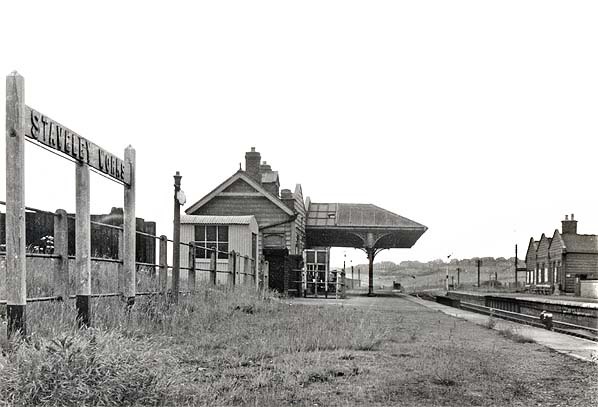 Staveley Works station looking south-east along the down platform c late 1950s. Note the BR LMR totem sign on the lamp post next to the running in board. 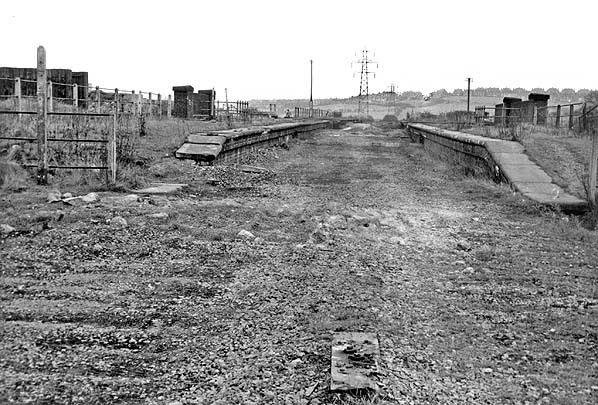 Looking north-east along the Chesterfield Canal from the down platform in March 1969. The demolished bridge is in the foreground with the bisected up platform seen either side. Staveley Works Station 'up' platform in July 2008. Looking south-west along the Chesterfield Canal in July 2008. The demolished bridge that severed the platforms is seen beyond the lock. The bulk of the platform remains are to the left.